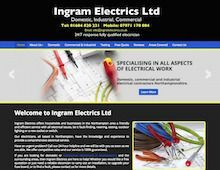 Ingram Electrics are electrical contractors in Northamptonshire, offering a wide variety of electrical services, so contact them today if you need a domestic electrician or commercial electricians in Northampton or the surrounding area. Ingram Electrics electricians work throughout Northampton and the surrounding area to provide domestic electrical services. So if you are looking to install new lighting, re-wire your property, install fire alarm systems or undertake many more electrical services, Ingram Electrics can provide an electrician in Northhampton and the surrounding Northamptonshire area. Emergency electrical services area also available, and Ingram Electrics can be contacted 24/7 if you need an emergency electrician in Kingsthorpe, Northampton or the Northamptonshire area. If your business requires the services of electrical contractors in Northamptonshire, Ingram Electrics provide a full variety of services. So if you need PAT Testing in Northampton, office lighting fitted in Kingsthorpe, or many other services requiring commercial electricians in Northampton and across Northamptonshire, contact Ingram Electrics. Whether your electrician needs are commercial or domestic, contact Ingram Electrics today for a quote.